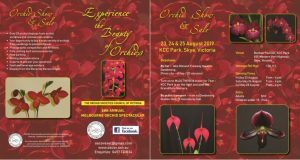 OSCOV – The Orchid Societies Council of Victoria (OSCOV) is the state body for Orchid Clubs in Victoria and has 30 Member Societies. Its aim is to support its member societies and promote the growing of orchids. 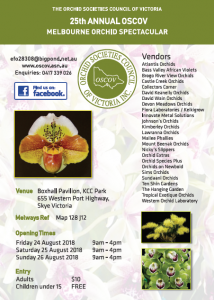 OSCOV is the primary peak body for orchid societies based in Victoria, Australia. The PowerPoint presentation of the OSCOV VOOTY awards for 2018 is now available! Flyer for the 2019 OSCOV Show! The OSCOV Judging Panel decided the 2018 Victorian Orchids of the Year earlier today. 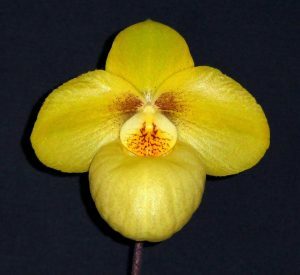 The Orchid of the Year was Paphiopedilum Golden Goblet ‘Brian’ grown by Michael Coker. For all of the winners – click here! 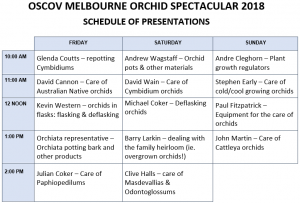 The dates for the OSCOV Melbourne Orchid Spectacular in 2019 have been set! The Spectacular will be open to the public on Friday 23, Saturday 24 and Sunday 25 August 2019 from 9:00am to 4:00pm on each of those days! Make sure you put those dates in your calendar. Here are the Champions from 2018 – including a new FCC/OSCOV for a wonderful Masdevallia! Here is the presentations schedule for the 2018 OSCOV Show! 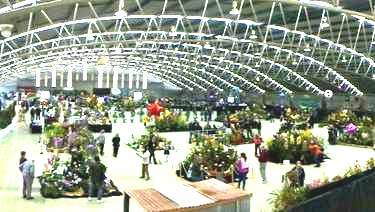 Preparations are well underway for this year’s OSCOV Melbourne Orchid Spectacular. More details can be found here, or from the OSCOV Show Facebook page here. It’s an Australian orchid event not to be missed!